The thousands of secret US files published by WikiLeaks document US war crimes in Afghanistan and Iraq, anti-democratic plots and interventions around the world, and massive global surveillance and computer hacking by the CIA and other US intelligence agencies. The letter also refers to the unsubstantiated conspiracy theory concocted by the US spy agencies and the Democrats to accuse WikiLeaks of aiding Russian “interference” to secure Donald Trump’s 2016 victory. In reality, WikiLeaks published documents, which it insists were not provided by Russia, proving that top Democratic Party officials sought to sabotage the campaign of Bernie Sanders in the primary elections and that Hillary Clinton gave speeches to Wall Street bankers pledging to protect their interests. 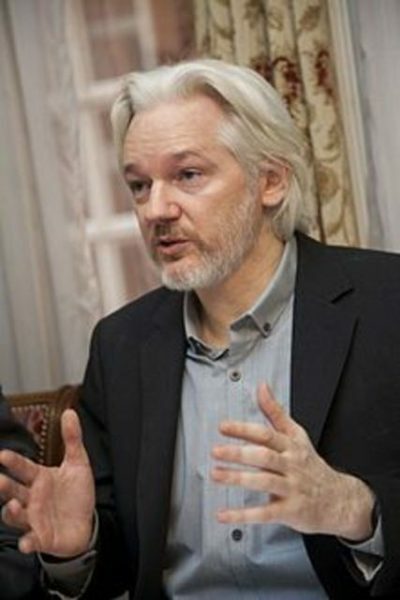 The letter brands Assange “a dangerous criminal and a threat to global security,” who “should be brought to justice.” The truth is that Assange and WikiLeaks have courageously continued to publish leaked documents that expose the truly “dangerous criminals”—the US ruling class and its allies, and their illegal invasions, assassinations, regime-change operations and mass surveillance. As for “justice,” the American intelligence, detention and judicial agencies have a documented record of torture, frame-ups, show trials and incarceration of “enemy combatants” without trial. The letter adds: “Most recently, we were particularly disturbed to learn that your government restored Mr. Assange’s access to the Internet.” This is also a false assertion. Last Friday, under the guise of partially restoring Assange’s right to access the internet and receive visitors, Moreno’s government sought to impose a new “special protocol” that provides a pretext for terminating the asylum that the previous Ecuadorian government of Rafael Correa granted him in 2012. Anyone seeking to visit Assange would have to give the Ecuadorian embassy three days’ notice and wait for written authorisation by the head of the embassy, which could be arbitrarily refused or cancelled without any reason being given. Visitors would have to provide the Ecuadorian authorities with full ID details and either hand over or clear all mobile phones and other communications devices. Far from restoring Assange’s basic democratic rights, the protocol would reinforce the political silencing imposed by Ecuador in March. In direct violation of the right to asylum, it seeks to forbid him from making any comments that criticise or could offend any government, particularly those with “good relations” with Ecuador. One of the possible grounds for a US application to extradite Assange may well be an indictment against the WikiLeaks editor by the Mueller investigation into purported “Russian interference” in the 2016 presidential election. A concerted effort has been waged by US intelligence agencies, the Democratic Party and media outlets such as the New York Times and the Guardian to slander Assange as an agent of both the Putin regime and the Trump campaign because WikiLeaks published the damning exposures of Clinton. In what may be related to the attempt to link WikiLeaks with Russia, Moreno’s government this week released documents purporting to reveal that it sought to get Assange out of its embassy last December by naming him as a political counsellor to the country’s embassy in Moscow. Russia’s embassy said on Twitter that the material was “another example of disinformation and fake news.” The embassy repeated its denial of similar reports produced by the Guardian last month. WikiLeaks associate and former British whistle-blower Craig Murray has also publicly rejected claims that Assange wanted or requested to go to Russia. The files were made public on Tuesday at the instigation of right-wing opposition legislator Paola Vintimilla, whose Social Christian Party opposed the former Correa government’s decision to grant Assange nationality. Assange, an Australian citizen, was compelled to turn to Ecuador in 2012 because the Labor Party-led government in Australia fully lined up with the Obama administration and denied him his right to assistance and protection against persecution. Under Moreno, who assumed the presidency in May 2017, Ecuador’s government has turned against WikiLeaks and Assange as part of its efforts to reforge relations with Washington. The decision to cut off his communication and visitation rights on March 28 this year was taken one day after the US and Ecuador held top level military talks. Moreno has since repeatedly threatened to repudiate Assange’s political asylum in an apparent effort to pressure him into “voluntarily” leaving the embassy. As the conspiracy against the WikiLeaks editor escalates, the World Socialist Web Site reiterates its call for all defenders of democratic rights to fight for the unconditional freedom of Julian Assange. It is an essential component of the broader struggle in defence of freedom of speech and an independent and critical media in opposition to the growing censorship of oppositional views by governments and corporate giants such as Facebook and Google.